Specifies a title formatting script to remap the contents of these fields. Specifies a title format script that determines whether a track is part of a compilation. The script should output 1 for compilations, and nothing otherwise. Specifies a sort order title formatting script to remap the contents of these fields. Specifies that sort order metadata fields from tags are to be used instead of sort order title formatting script to remap the contents of these fields. 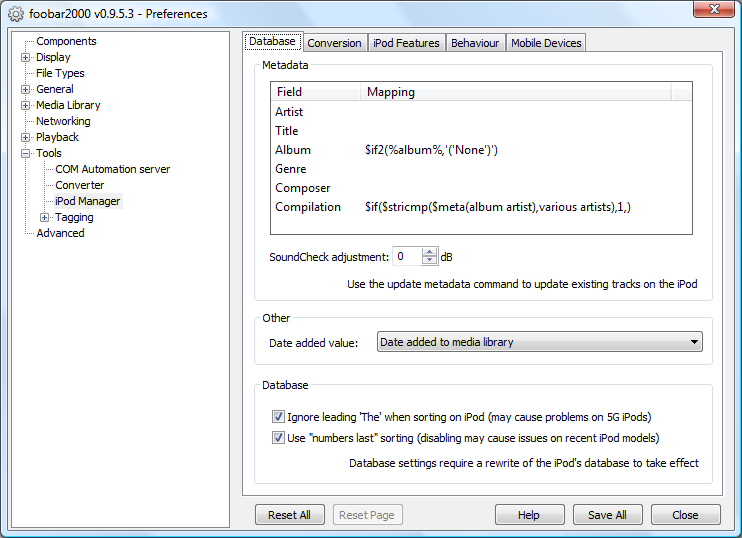 Specifies the adjustment to be applied when converting ReplayGain data to SoundCheck data. On the File menu, point to iPod, and then click Load library. On the shortcut menu for the affected tracks, point to iPod, and then click Update metadata on iPod. On the File menu, point to iPod, and then click Rewrite database. Specifies the value of the date added field on the iPod. Date added to media library requires the Playback Statistics component. Ignores any leading 'The' and 'A' when sorting items and browsing tracks on the iPod. For example, The Simpsons would be listed under S. This option can cause issues with some 5G iPod firmwares with respect to the “scroll by letter” feature. Places numbers and symbols last when browsing tracks on the iPod. Disabling this causes some issues with the “scroll by letter” feature on the iPod Classic/Nano 3G/touch/iPhone.